Organization, order and patterns. We all crave the familiarity that they provide in everything we do. The music we listen to, the movies we watch and the books we read all contain recognizable features and conventions. An ostensibly chaotic world when examined more closely shows patterns and logic in nature and is an indication that the tendency to seek out routine is hard-wired into us at birth. Simple and repetitive methods of presentation don't prevent us from enjoying a television drama or a performance at the theatre. As long as the content packaged within those frameworks is well-written and engaging, the sense that we've seen it all before with a different twist rarely reduces the enjoyment. In fact, experimental forms of artistic endeavors are probably held to a higher standard to offset the audience's feeling that they're in strange territory. The popular American television drama House, which follows the life of a doctor and his interns at a teaching hospital, offers up a weekly episode that rarely strays from a predictable formula. Each show begins with a "cold open"--the term used to describe a TV show that jumps directly into the action before the opening credits--that depicts a patient suffering the onset of their condition. The focus then shifts to the hospital where the acerbic Dr. Gregory House berates, insults and pushes the doctors under his watch to correctly identify the sickness. At least one mis-diagnosis occurs, the patient has a seizure, and a dilemma arises in which a potential life-saving treatment could also result in death if the doctors are missing something. The young physicians are usually sent to break into the house of the sick person to search for clues that will help them fill holes in the patient's history. This fits in with the running theme that, according to Dr. House, all people lie, especially those suffering from an illness. 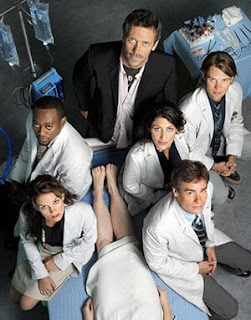 One or two lighthearted scenes in which House sees a new patient often provide him with a revelation that helps to solve the puzzle related to the main case. These elements are present, almost without fail, during every single episode of the show. But it doesn't matter that you have some idea of what is coming. Because the dialogue is clever, the characters are interesting, the action creates tension and it all contributes to an enjoyable viewing experience. Patterns and routines are important in the classroom as well. That statement may elicit images of mind-numbing drills and rote methods overseen by a strict disciplinarian. But the reality is that establishing familiar practices in the educational environment is a critical part of effective learning. Recognizing commonalities and distilling concepts into their component parts is an essential part of being a teacher. Even if you are relying on exercises and explanations from textbooks, you develop an eye for those that are best at breaking things down before building them up layer by layer. Language learning particularly provides numerous opportunities for teachers to highlight tendencies. Being aware of the differences in the language being taught and the student's native tongue is an obvious focal point likely to present the most problems. It's natural for any student to apply the rules of Thai to English and come up with understandable but mistake-riddled sentences. A simple activity involves having students take what they know about English and apply it to Thai as if their first language were English. They can create nonsense past-tense verbs in Thai, switch the adjective/noun order and try to speak in a monotone. The really clued in students will imitate some of the common errors they have heard foreigners make when trying to speak Thai. It all results in some fun with the aim of making students aware of how languages differ. Pointing students towards discernible characteristics of concepts that are being taught is not the only time that patterns come into play. Day-to-day classroom routine is one of the most useful tools that a teacher can utilize. This doesn't discount the teacher's need for preparation, knowledge and energetic delivery. And it doesn't mean that there must be a dry and unimaginative handful of activities that repeatedly take place without any variation. It can be as simple as the organizational style in which the instructor presents information on the board. Or the standard arc that each session follows, with the most free-flowing and independent time for practicing specific language functions taking place near the end of the period. Sometimes the conventions that become part of every teacher's modus operandi are practical and meant to strengthen habits that will carry beyond graduation. Thus, one of the most important lessons for pupils regarding habits is understanding what the teacher, and one day society, expects from them. The standard procedure for submitting assignments is one example. This could include the insistence that all submissions be typed, the deadline be adhered to and the expected length followed. Some routines, such as the board work style of each teacher, are self-explanatory and become familiar over time. Others, such as assignment guidelines should always include the rationale. Introducing the notion of patterns as a specific topic worth discussing is beneficial as well. Directing students towards organization and self-discipline in preparing for the real-world is one good way to do this. Successful people in life are not always the most intelligent nor are they necessarily the individuals with the most years of schooling. Those who can recognize patterns no one else sees often go the furthest in a particular field. Whether in personal interactions, customer behaviour or a myriad of science related industries, the art of analysis as learned in the classroom can be transferred to the real world. The explicit discussion of different styles of organization becomes another routine that students get accustomed to. And it makes those instances when you try something different resonate all the more because of the contrast. Similarly, it allows you to encourage your students to take the customs that exist in any subject area and learn to add to, refine and ultimately innovate so that they might create new patterns and become the leaders of tomorrow.